David Merrin’s guitars are constructed using only the very best materials and David personally chooses all woods used for each instrument. The main woods used are alpine spruce for the soundboard, Indian rosewood for the back and sides, cedar for the neck and ebony for the fretboard. The techniques of construction have been developed from traditional methods; the soundboard is constructed using fan strutting with open harmonic bars; the head is fitted with a traditional ‘V’ joint. The guitars are light in weight in order to give a clear and balanced sound with good tonal variety. 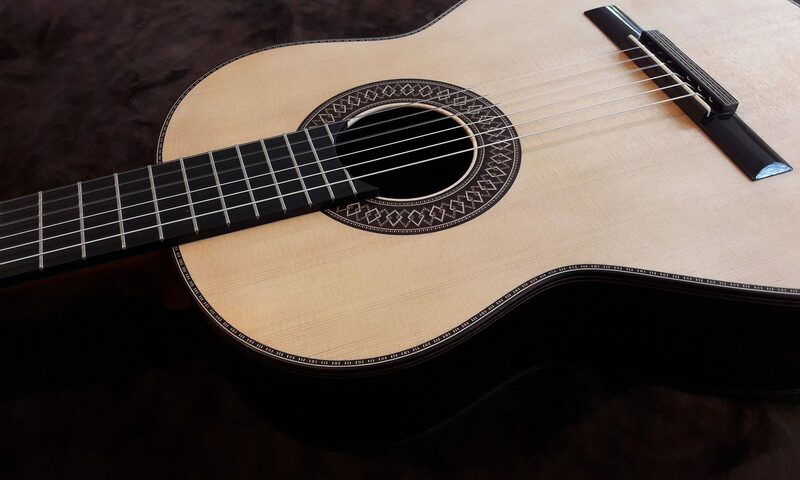 The guitars are finished using the traditional method of French polishing so that the sound of the instrument is not inhibited. Alessi machine heads are now fitted on David Merrin guitars and each guitar is supplied in a Hiscox case. 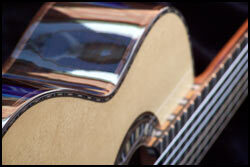 For further information and prices contact David on david@davidmerringuitars.com. Take a look at the 5 minute video below where David Merrin explains how he makes a guitar.